Cooler Master is a company with a tradition of cooling-related products and thus it is no wonder that they jumped into the AIO liquid coolers wagon almost instantly. They have a healthy selection of products and decided to ship us their two Nepton series coolers, their most popular series at this point in time, along with the Seidon 120V, a very low cost, entry level solution. The Cooler Master Seidon 120V is the smallest, simplest and least expensive AIO cooler of this review. The packaging reflects that, being a relatively simple brown cardboard box, unlike any other in this particular roundup. Looks aside, the packaging is well designed, full of information on the cooler, and the cooler is very well protected inside the cardboard packaging. Inside the box, the user will find a leaflet with installation instructions, the necessary mounting hardware, and a syringe with thermal compound. Also included is a single 120mm fan with a wide speed range of 600 to 2400 RPM; it is an all-black model with wavy blades. Both technically and aesthetically, the Cooler Master Seidon 120V is a rather simple design. The 27mm thick, 120mm wide radiator is the smallest and least expensive design available today. Wavy aluminum fins are formed between the liquid pass-through channels, which are not dense but not sparse either. There are imperfections in the fins but these are to be expected with a low-cost radiator. The square block-pump assembly is entirely made out of plastic, which is not bad in terms of durability but gives a feeling of cheapness. 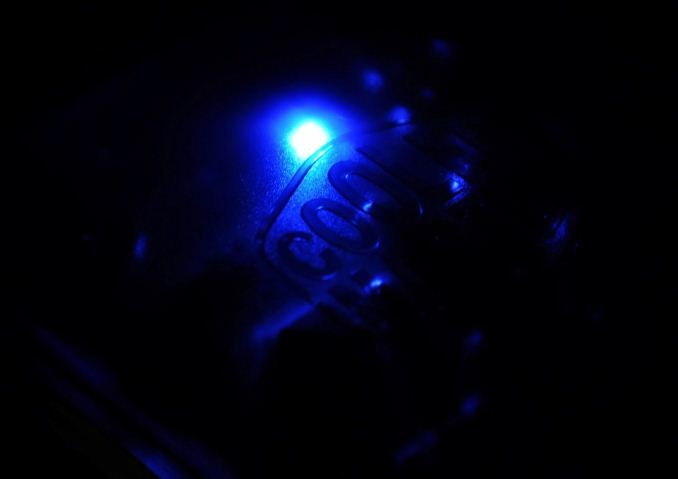 The company logo is etched on the top of the block and a bright blue LED turns on when the pump is powered on. Only the base of the block is made out of copper, which is expected given the price. This copper base has been attached to the rest of the assembly with the aid of ten triangular screws and has a smooth, well-machined surface, although it has not been machined down to a mirror finish. The tubing is corrugated and a little hard to bend but at least the fixing points on the CPU block assembly are rotatable sideways. Unlike the basic 120V, the Nepton 140XL is a significantly more sophisticated, detailed product. It does however cost twice as much as the 120V. It comes supplied in a carefully designed black-purple cardboard box, well protected inside cardboard packaging. The bundle is not much different than above, limited to the necessary mounting hardware, a leaflet with installation instructions, and a syringe of thermal compound; a Y-splitter for the attachment of two fans onto one header is also included. Two powerful 140mm fans come with the cooler, with a speed range of 800 to 2000 RPM. These "Jetflo" fans are supposed to have high static pressure and the rubber pads absorb vibrations, reducing noise. Visually, the Nepton 140XL is not much different from the Seidon 120V. Technically, the two coolers are nothing alike. The 140mm radiator of the Nepton 140XL is not only wider but is also 38mm deep, increasing the effective heat dissipation surface by well over 50%. Size aside, the design of the radiator is similar, with wavy aluminum fins between the heat exchanging channels and with a frame offering the ability to mount either 120mm or 140mm fans on it. However, it would seem that manufacturing imperfections are still present, with several of the fins significantly deformed. It appears as if the radiator was struck with something, deforming half a channel of fins, yet we received the packaging in excellent condition and this side of the radiator was facing inwards, towards the center of the packaging. 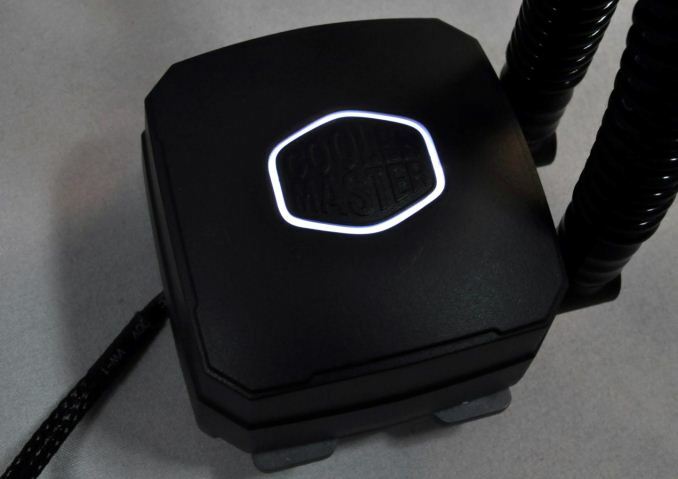 Quality control issues in Cooler Master's manufacturing paradise are the only reasonable guess we can make -- that or the cooler was previously tested and repackaged for our review, though that seems unlikely. The square block-pump assembly is once again entirely made out of plastic. Even though it looks much better and of higher quality than that of the 120V, plastic rarely is the way to go when you want a worthwhile aesthetic outcome. The company logo is etched on the top of the block and is surrounded by a frame with a white LED, which turns on when the pump is powered up. A plastic frame is sandwiched between the cap and the base of the assembly, with holes for the mounting of the installation brackets. The copper base of the assembly is smooth but not machined perfectly; although they cannot be felt by touch, the sandpaper grooves are clearly visible with a naked eye. The Nepton 280L is Cooler Master's heavy artillery. We received it supplied inside a well-designed cardboard packaging with a black/purple color theme, visually very similar to that of the 140XL. The main attraction of the kit, the large 280mm radiator, dominates the theme of the box. Inside the box, with the exception of a slightly different installation instructions leaflet, we found the exact same bundle as that of the 140XL, including two of the same 140mm "Jetflo" fans. The Cooler Master Nepton 280L might appear like an oversized version of the 140XL but it really is not. They do share many similarities but the main part of the kit, the radiator, is very different. The radiator of the 280L, as the name suggests, is 140mm wide and 280mm long, with room for up to four 140mm fans. The frame also offers support for 120mm fans, if the user would like to use 120mm fans instead for whatever reason. However, the radiator of the 280L is only 30mm thick, which is about 25% less than that of the 140XL. Therefore, although the heat dissipation surface is greater, it is not actually double that of the 140XL. Once again, minor deformations of the aluminum fins can be seen, although not nearly as many or as serious as those we encountered on the 140XL. The square block-pump assembly is entirely identical to that used by the 140XL as well. It features the exact same size, mounting mechanism, pump, core and everything else. The same white LED lighting frame at the top of the block has also been installed. Unfortunately, the same mediocre copper base is also present, which could use a little bit better polishing for a product of this league and price range. Excuse me for pointing this out, but are the noise levels given here not a little bit bogus? On your "Testing Methology" page, you qualify 50-54 dB(A) as "Extremely loud (level equivalent to a ≈1500W vacuum cleaner)". Then on the next page in your 12V results, you state: "To give you a rough estimate, 56 dB(A) represents about the same level of sound as a typical box fan the same distance." Are you honestly trying to imply that a CPU fan is capable of producing a typical noise scenario that is twice as intense as a 1500W vacuum cleaner at full bore? I think that either the table under "Testing Methodology" is wrong, or you performed your tests in a way that generates results which have absolutely nothing whatsoever to do with the scale presented in the table. In both cases, said table is in dire need of a revision. "This all changed in 2012, when Asetek came up with an inexpensive closed loop solution, a liquid cooling device that was leak-free and required no maintenance at all." That's the ideal, but the reality seems far off. I just got 2 AIOs but I'm feeling a little bit of regret. I'm now debating whether or not I should put them in my 24/7 systems after reading about reliability. I can tolerate clicking pumps and failed pumps. Overheating will be monitored and the system can shutdown. However leaks are problematic. Leaks which can occur in small trickles or explode in fantastic fashion and can destroy a system. Insiders seem to know of the inherent issues and that's why there have been several revisions to pumps and attachments and hoses. It's that worrying in the back of my mind that means I wouldn't build a water cooling rig. A big ol' air cooler like the NH-D14 will cool just as well with less noise (no pump noise) and if the "pump" fails (the fan) you have an easy task - snap on a new fan. When that pump fails, you're screwed.